Run to Failure - When Run to Failure selected for an Asset's Preventive Maintenance definitions, system will not generate any PM work order till asset fail.Once Asset fails, system will let you create a repair WO for Asset. 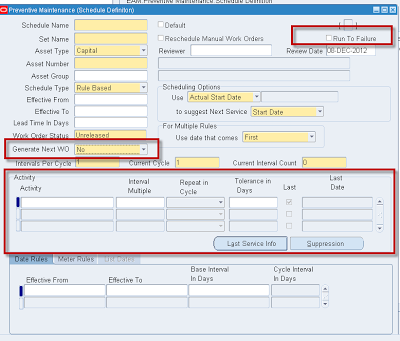 If generate WO set to YES , Preventive Maintenance Scheduler will not Create WO till previous/existing work order got completed. If generate WO set to YES , Preventive Maintenance Scheduler will create WO even if their exists a open workorder.